At the centre of the Sunshine Coast region lies a popular area where holiday opportunities are endless. 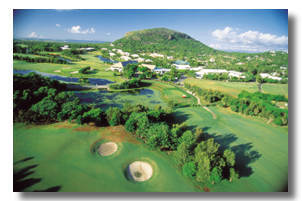 An area that combines the best of all the Sunshine Coast has to offer. This is Maroochy - the area that includes Coolum, Maroochydore, Mooloolaba, Alexandra Headland, and the vast expanse into the Blackall Range. The four surfing beaches of Coolum, Maroochydore, Alexandra Headland and Mooloolaba combine to produce a fantastic holiday destination for families with children of all ages as well as young people looking for adventure. From boutique dining and fast paced shopping outings to relaxing lazes on white, sandy beaches, this area will have you captivated. 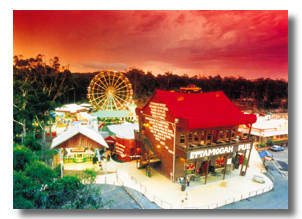 If you're after a day of fun and adventure, there are many attractions that will keep you and the kids enthralled. Hand feed the deer at Forest Glen Sanctuary, taste Australia's largest range of honey at the Super Bee, visit the Big Pineapple or spend a day at Aussie World and the famous Ettamogah Pub. If it's nature you're more interested in, there are plenty of bushwalks in the Blackall Ranges or visit Fairhill Native Plants and Botanical Gardens. For something a little different take a leisurely drive into the Blackall Range and visit the quaint village of Montville, Flaxton and Mapleton. Here you'll enjoy strolling through the art and craft filled streets and enjoy true hinterland hospitality. If you're looking for romance or some serious R&R why not stay overnight in one of the gorgeous Bed and Breakfasts, cottages or homestays. On Saturday morning drive up to Eumundi and potter around the fresh fruit and vegetable and wonderful craft stalls of this famous market. 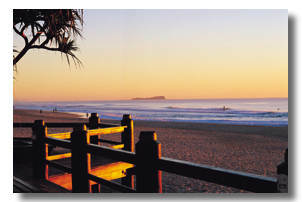 With so much to do and see there's something for everyone in beautiful Maroochy.